DIESEL trade magazine has named the new DEUTZ TCD 9.0 engine as its DIESEL OF THE YEAR. This 9-litre cubic capacity four-cylinder engine generates 300 kW and has been specially designed for heavy-duty construction equipment and agricultural machinery. The prestigious title of DIESEL OF THE YEAR is awarded each year to the most innovative engine. DEUTZ had previously received this award in 2010 for its compact TCD 2.9. 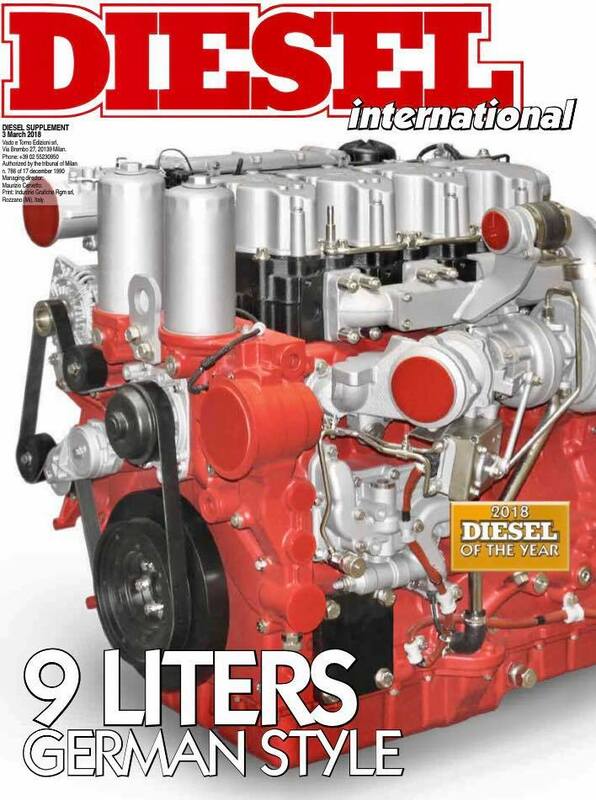 ‘DIESEL’ is one of the leading European trade magazines for this sector and has been reporting for 22 years on the development and manufacture of diesel engines and their applications. This same TCD 9.0 was also recently included by the trade magazine ‘OEM Off-Highway’ in its ‘Top Ten New Products of 2017’. The new DEUTZ TCD 9.0 four-cylinder in-line engine, generating 300 kW and 1,700 Nm of torque, forms part of a new family of engines; together with the TCD 12.0 (400 kW / 2,500 Nm) and the TCD 13.5 (450 kW / 2,800 Nm) six-cylinder in-line engines, it considerably extends even further the upper end of the DEUTZ power range. The family platform concept has a standardised customer interface and an identical front and back, considerably simplifying the tasks of integrating and maintaining the engines. The proportion of common parts is approximately 65 percent, which reduces servicing complexity and optimises inventory holdings. In future, the 620 kW TCD 18.0 six-cylinder in-line engine, which generates 3,600 Nm of torque, will occupy the upper end of the DEUTZ power range. Series production of all four engines will be launched in 2019 in time for EU Stage V. With these engines, DEUTZ is specifically catering for heavy-duty construction equipment and agricultural machinery with high output and torque requirements. 100 per cent power take-off is possible both at the belt and the flywheel side. Thanks to dynamic balancing weights, the four-cylinder TCD 9.0 achieves the same smooth running characteristics as the bigger six-cylinder engines. In the upper power output range, DEUTZ’s powerful new in-line diesel engines present the ideal solution for heavy-duty applications from both a technical and commercial perspective. In the lower power output range, DEUTZ will also offer electric drive systems in future under its E-DEUTZ strategy. Customers will be able to choose whatever is the optimum combination of conventional and electric drive components for their particular application. By significantly improving emissions and efficiency, DEUTZ is aiming to be the market leader for innovative drive systems in the off-highway sector and hopes to steal a march on the competition.